"Put the 18-200mm on an F6 and it becomes obvious why the lens has little light falloff at 18mm: the image circle isn't a circle! At this focal length the lens almost manages to cover the full 35mm frame; but it has a wavy pattern at the top and bottom of the frame that barely cuts off the corners. As you zoom past about 30mm the extension in the image circle disappears and you now have the traditional DX pattern of clipping the full frame corners significantly. This increases beyond 50mm so that the 200mm image circle is pretty tight to the APS sensor size. There's no point at which this lens covers the full 35mm frame." "The performance of my 18 - 200 VR is more than the sum of its parts. It's sharp, contrasty, focuses almost instantly, gets rid of hand vibration with VR and zooms with ease. What's more impressive when you own one is how well this all works together. It's unlike any of the dozens of other lenses I've owned. There's nothing that gets in your way. No need to change lenses. No balky zooming. No clumsy macro range lockout switches. No slow focusing. No practical close focus limit. No need to move a switch to focus manually. Manual focus is never too fast or slow at zoom extremes. It just works! Nikon's been making Nikkor lenses for over 70 years and Europeans have been at it for over 400 years. This is the first lens I've ever used that does all this as it should." Nikon Corporation is pleased to announce the introduction of the AF-S DX VR Zoom-Nikkor 18-200mm f/3.5-5.6G IF-ED, a compact, lightweight 11.1x zoom lens that is ideal for everyday photography and incorporates advanced features such as Nikon ED glass, SWM (Silent Wave Motor) and enhanced VR (Vibration Reduction), as well as featuring optics optimized for use with Nikon digital SLRs. The lens offers users the remarkable 18-200mm focal length range, which conveniently covers everything from wide landscapes to tight portrait shots. 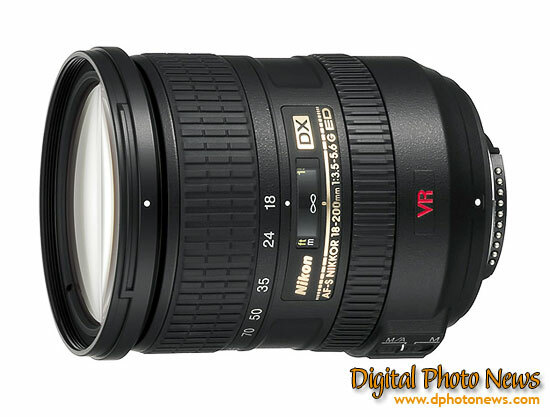 (The picture angle is equivalent to a 27-300mm lens in 35mm format.) Advanced Nikon engineering has given rise to a compact lightweight design that offers excellent handling characteristics. The highlight of this versatile powerful zoom lens is the benefit of improved Vibration Reduction (VR II), an innovation that makes it possible to take substantially sharper handheld pictures at slower shutter speeds than would otherwise be possible. This provides the distinct advantage of being able to shoot more effectively in a much broader variety of challenging lighting conditions. With the new VR II advantage, users can take pictures at shutter speeds as many as 4 stops slower* than they ordinarily could shoot without camera shake with a non-VR lens! Nikon’s VR technology further enhances picture taking potential with a choice of two modes to match more shooting conditions. VR Normal Mode primarily compensates for camera shake, and includes automatic panning detection. VR Active Mode effectively compensates for vibration in situations where it is more pronounced and more frequent, such as when shooting from a moving vehicle. Additional proven Nikon features and technologies offered in the AF-S DX VR Zoom-Nikkor 18-200mm f/3.5-5.6G IF-ED include the compact SWM, which combines fast and precise autofocusing with super-quiet operation, two ED glass elements and three aspherical lens elements that provide for higher resolution, high-contrast images while minimizing chromatic aberration, astigmatism and other forms of distortion.